This apartment has 795-850 square feet of living space. It features a large living room, dining area, and a pass-through kitchen. This apartment has ample closet space with a linen closet in the bathroom, two pantry closets near the kitchen, and a coat closet in the living room. 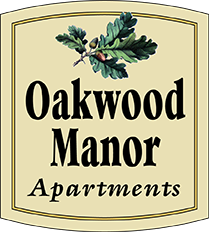 Rent for this apartment home starts at $795. Enjoy the convenience of your own washer and dryer in this one-bedroom, one-bath apartment. 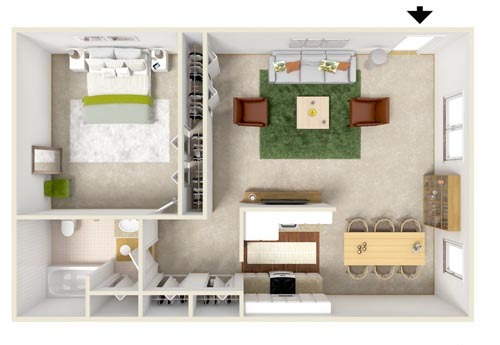 This apartment has 795-850 square feet of living space and rents from $825. At 1,000 square feet, this spacious home has all the room you need – including a walk-in closet in the foyer! You’ll appreciate the large bedrooms with closets, the pass-through kitchen, and the open layout. This apartment begins at $950. 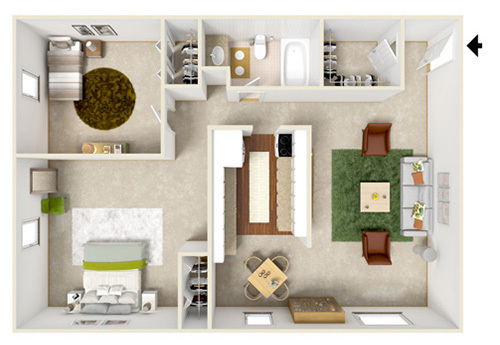 This large three-bedroom, two-bathroom apartment has 1,200 square feet of living space. Rent this apartment, starting from $1,100.